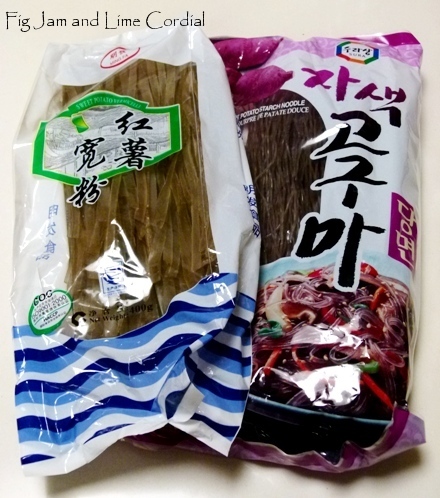 Remember the sweet potato noodles I bought recently? We all loved this, particularly Big Boy who is very fond of Korean cuisine. It’s easy to make and can be served at room temperature, which makes it a great do-ahead dinner party dish! It looks delicious, and very authentic, too. Did you serve it with kimchi? It does look yummy, your boys are very lucky. Next time I am over, I will !! That looks delicious. Do the noodles taste like sweet potato? Your Japchae looks mouth watering good. Was window cleaning and am starving, could use a bowl right now. Looks delicious, love the fact that you’ve used home-grown veg in Korean cuisine. I have some great beef from a local smallholder that I’d been meaning to stir fry in some sort of noodle dish, may have to give this a go. That looks scrumptious! Great dish for the warmer days ahead! I must have missed your earlier post about the noodles as this is all news to me. Looks like a great dish! Amanda, they’re great fun, I hope you find some to play with! They’re pretty widely available in Asian grocery stores in Sydney now! Just ate this dish at a Korean restaurant. It was great. Was a little leery when the waiter told me that the consistency of the noodles was “like gummi bears.” You’re right though, they are a little bit chewy, but did not remind me of gummi bears! I love the texture of this noodles, and you just reminded me that I still have some in my cupboard. Looks yummy. Are the sweet potato noodles gluten free? Meg, I *think* so, but I couldn’t find anything about it on the packaging, so I can’t be sure. Potato noodles are a favourite of mine but your efforts look much nicer than the food court version I eat on occasion. I’ll keep an eye out for them. It hadn’t occurred to buy and cook them myself! ED, I’m the same, I liked eating them, but was mystified as to how to cook them. I hope you try them, they were remarkably simple to make! They should be, like glass noodles are, and I’ve never had any trouble with any so far. All yummy! That looks really good and I like the idea of not frying the noodles. Pat, that bit surprised me too! I always end up overfrying my noodles and ending up with it all going a bit mushy, so this was a welcome alternative. That looks so good Celia, but I have to confess I’m still rolling the word ‘enrobing’ around in my head! Just the word and the vision of the enrobing ceremony had me transfixed!! Jan, it IS a great word, isn’t it? I can still remember watching a chocolate enrobing machine at work – it was a sight to behold! These are some of my favourite noodles ever! I love the sesame flavour :D Yours look packed with flavour! Thanks Lorraine, I had to toast the sesame seeds, but I think they sell pre-toasted ones at Harkola! I saw that photo and I could feel my face forming a smile. What a lovely dish! Maureen, thank you! It IS very pretty, isn’t it? I’m a fan of Korean food, Celia and this dish sounds really delicious! Great tutorial from you, as always! This sounds scrumptious & looks beautiful as well. Those noodles are really interesting.